I have had an interest in Japanese Art going back to the mid-1970s and a few days ago I downloaded an interesting free app named Japanese Traditional Art Gallery for iPad Lite. I reviewed this then and noted that the icon for the App used the well known Great Wave off Kanagawa by the artist Hukusai. While looking through the iTunes App Store, I saw another app using an identical icon. This review first appeared on AMITIAE in June 2011 and has now been revised. When I had a closer look at Hokusai HD, I found this was one of a series of apps by the developer, Overdamped, each of which focuses on the works of one artist. 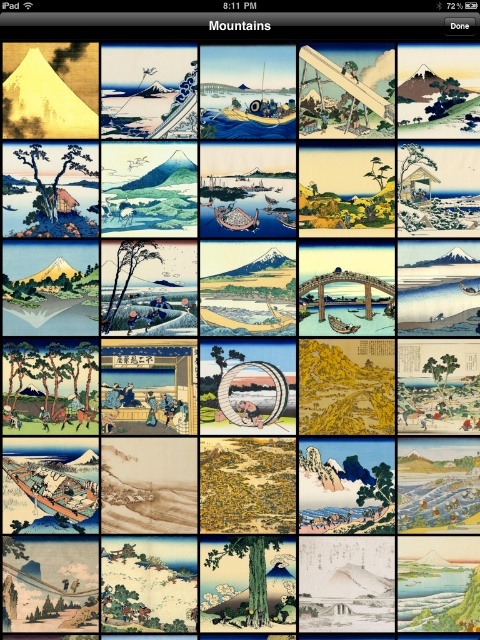 As well as the app for Hokusai, I was also pleased to see one for Hiroshige as well as some 50 other artists. Each of these apps is priced at $0.99 so I downloaded a small selection, starting with the two Japanese artists. Initially, although I tried to move the Hokusai HD app to an Art folder I created, it kept going back to the invisible page 12 of apps. A restart of the iPad showed me a greyed-out image and when I examined this it showed the start of a download. When I had first made the purchase, the download had failed and I was informed that it would be synced from iTunes. After several tries to install it from iTunes, I tapped on the grey app and was asked for my password. Then it installed properly. 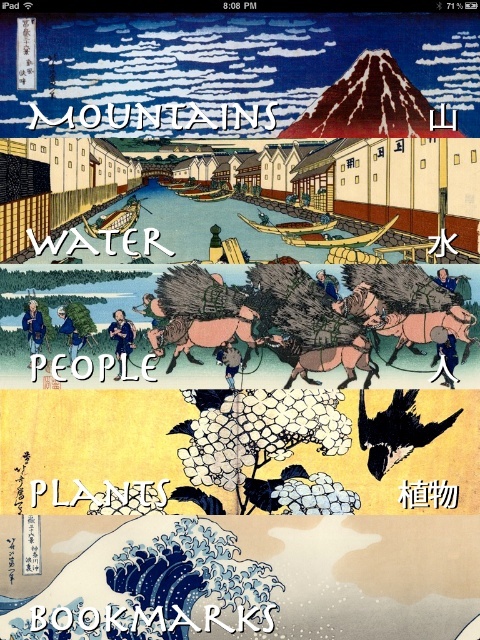 Unlike other apps of this series (such as the Seurat and Monet that I had also downloaded) which are organised by date, the index for the Hokusai presented types of work: Mountains, Water, People, Plants, with a Bookmarks section at the bottom. Clicking on one of these enters the section and one after one the images can be scrolled through with a sideways swipe. At the top of the screen are two controls: Main to return to the menu; and All to display thumbnail images from the section. Tapping one of these goes directly to the selected image. There are also several controls at the bottom of the screen, starting at the left with Music. There is no indication what this is (title, artist) although it certainly sounded traditionally Japanese. It may have been a modern rendition, but it was not obtrusive and felt right for the appp. 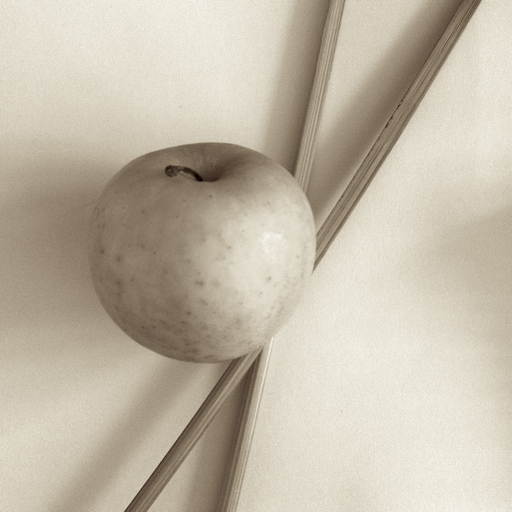 I imaging sitting down examining the images slowly, one by one, with a glass of sake handy. Other controls at the bottom were left and right arrows for forward or back through the images, a slideshow arrow and a W for Wikipedia information. As far as I was able to see this was greyed out apart from when the Great Wave was displayed. An Export arrow allows users to save images to the Photo Library, Save to Bookmarks or to send an image via email. This was a bit slow perhaps because of the image size. This depends on the image selected: one I used was 5.1MB while another was 786KB. The larger one gave me a PNG file sized 23" X 26". Hokusai is widely known for his 36 views of Mount Fuji, a series of images. One of these is the Great Wave. However his output was prolific and as well as the prints, featured here, there are examples of calligraphy and simple drawings, some of which I was offered in London many years ago. The whole series is online on several sites, such as the Portuguese site of Manuel Paias. Although Hokusai is famous for the prints, there was a large body of other work like painting, and this is also represented here including a famous self-portrait. Unlike the Japanese Art app I examined before, there is information about each image. This is accessed by tapping the screen. Another tap clears the text. What is interesting about many of the prints of Hokusai (and Hiroshige) is that despite the majesty of the background (Fuji, a waterfall, the sea or the sky) the foreground often shows images of mundane tasks: statements of the everyday life in Japan. There is a good mix of the artist's output and while there are many familiar images the developers have also managed to include several with which we may not all be familiar and there were one or two pleasant surprises for me. 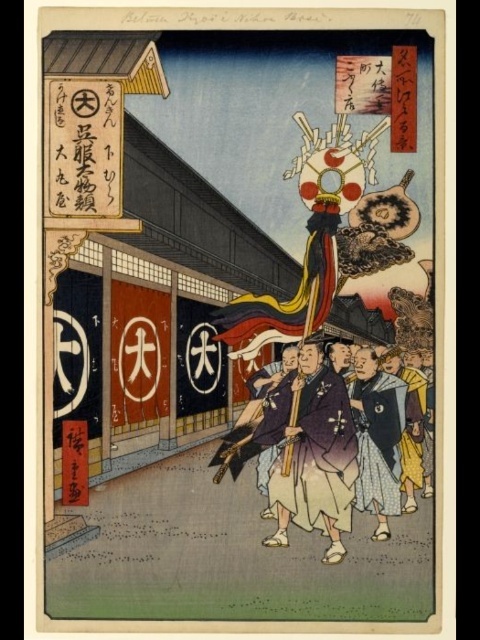 I was also pleased to find Hiroshige represented in this Overdamped series with the Hiroshige HD app. 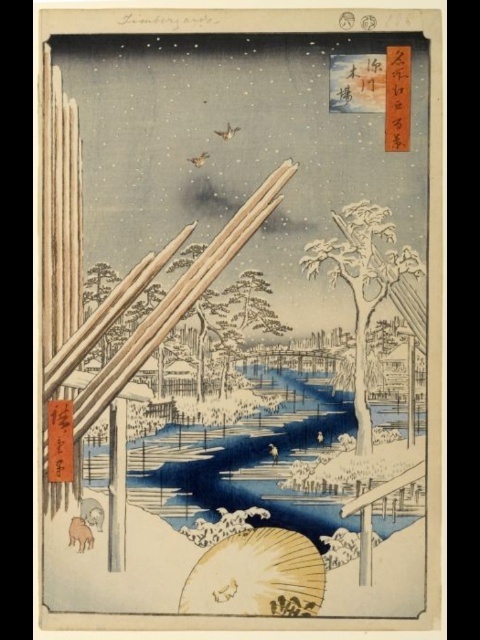 Hiroshige was working at the same time as Hokusai and was strongly influenced by him. This may be seen in his own 36 views of Fuji which are all produced in portrait mode rather than Hokusai's preferred landscape. The colours too are bolder: more saturated. We are less likely to see faces in the prints of Hokusai (they are often turned away or covered with hats), but when we do the shape is clearly different from the faces that Hiroshige draws. These views are more a homage to the senior artist, and this may be seen in several of the prints, most notably in The Sea of Satta in Suruga Province, where a large wave mirrors Hokusai's version without the claw-like structure and (with birds in the sky) there is no threat to boats or humans. 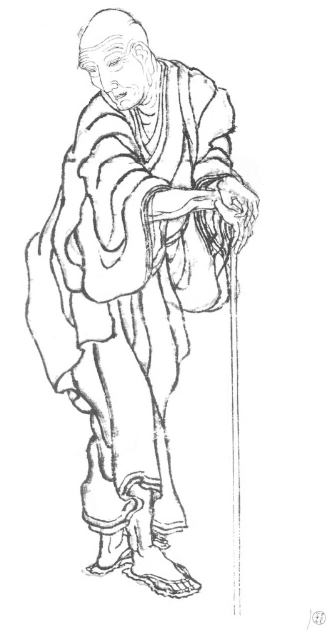 The app is constructed in the same way as that for Hokusai, so familiarity with one means ease of use with all. The index, however, because of the different output of this artist, is sectioned in a different way: The 53 Stations of the Tokkaido; The 69 Stations of the Kiso Kaido, The 36 Views of Mount Fuji, Series II and Series II; The 100 Famous Views of Edo, Spring, Summer, Autumn, Winter; and Bookmarks. There are more images with this artist's app and the download size was 127MB as opposed to the 68MB of the Hokusai app. Although the views of Fuji are similar to Hokusai's and were meant as a homage to the older artist, the main body of work seems to be far closer to the portraying day to day realism. 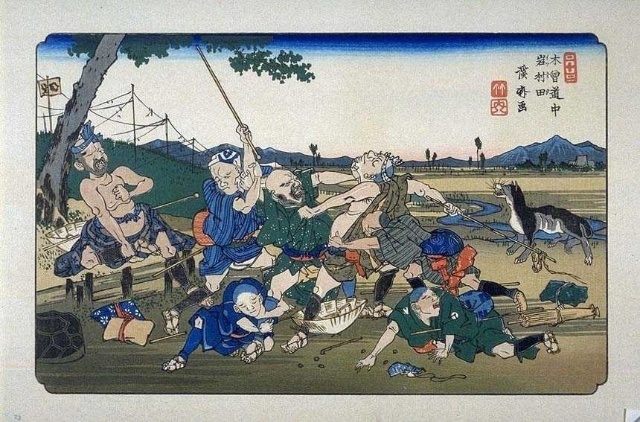 Several scenes depict the lives of ordinary people with the occasional injection of humour, such as with what appears to be a drunken brawl at Iwamurata (69 Stations of the Kisokaido). This series, and several more here had entries in Wikipedia, so this feature of the app was more usable and gives the interested novice some background material to what is displayed in the app. Each of these apps give a user a fairly wide selection of images from the output of one specific artist. When I was studying the artists featured here, I would often have open on a table in the library upwards of half a dozen books, but the whole of that is condensed to the iPad and its display. On top of that, I may save and export any of the images, discover more about them (albeit within the limits of Wikipedia). Those who were truly interested would not stop there of course. This is a valuable little series and for $0.99 each app, the access to such Art -- and to access it so easily -- is useful.